JOSH WARRINGTON sees double every day when he looks lovingly at his twin daughters, and now they are set to be the downfall of Carl Frampton. Nick Manners who helps Warrington’s dad Sean O’Hagan train the IBF Featherweight champion believes the boxer’s daughters, played a major role in his shock world title win against Lee Selby in May – having been born weeks earlier. 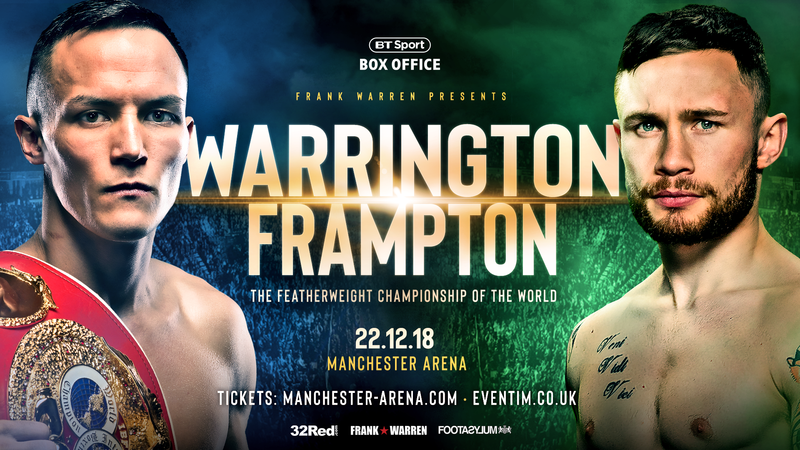 And now it’s Frampton’s turn to feel the force of baby power, when Warrington (27-0) makes the first defence of his title at Manchester Arena on Saturday December 22, live on BT Box Office. Manners said: “People say they say there’s a difference in fighters when they become world champions, but to tell you the truth I noticed the difference when Josh became a father before the Selby fight. “That meant more to him than being a world champion. Being a Father with a world title in the offing that gave him serious drive before Selby. Besides a five month training camp before Selby and becoming a dad for the first time, Warrington has also moved house with his family during preparations for his tough first defence against Belfast’s Frampton (26-1). That means a nonstop 2018 with rest at a minimum. Manners added: “We’ve talked about how busy he is away from the ring and we have discussed that, but sometimes you need distractions away from boxing. “I’m glad the distraction isn’t pubs, women or this, that and the other. It’s things that are life and no matter what is going on in the boxing ring you still have a life to live. “He trains diligently. He is a very hard worker and needs a distraction. Having his babies switches his mind off. Moving house is stressful but it is still a distraction from boxing. Although most people cannot separate Warrington and Frampton when it comes to picking a winner, Manner believes his man hasn’t even scratched the surface. He says: “What you saw against Selby is just a piece of what Josh Warrington is capable of. “Given the opportunities what we are getting now, I think you’re gonna start seeing the best of the Leeds warrior. “Josh Warrington is the real deal. He has so many attributes to him. “I’m not saying he is a 10 out 10 fighter. I would put him at 7 1/2 or 8 out of 10, but that is enough to beat a lot of 10/10 fighters who may not apply themselves as diligently as he does. “He wants to learn, he wants to improve, he’s not scared to take a challenge. This is a real live challenge. “There are not many people who would want to fight Carl Frampton in their first defence, but we’re in it and here. “Leeds should never have been the last place in Yorkshire to get a world champion, but for some reason we were. “Sometimes the best things are worth waiting for and now we have a credible champion who ticks all the boxes. “At the end of the day, Carl Frampton still has plenty left in the tank. He is a credible opponent for anybody.